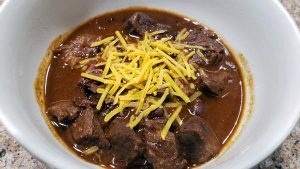 Nothing like a bowl of chili on a cold day. This recipe is sure to warm you up with big chunks of beef and spiced just right. Brown beef in a Dutch oven; drain. Remove beef. Saute onions until translucent over med-low heat. Add garlic and sauté another 1-2 minutes. Add beef back into onions and garlic. Add tomato sauce, diced tomatoes, beans, 2 cups coffee, cocoa mixture, paprika, cumin, salt, chili powder, and ground red pepper. Cover and simmer stirring occasionally for 1 1/2 hours, or until beef is tender. Serve with shredded cheese, jalapenos, sour cream and chopped onion on the side.